Bring the fast-paced game of table tennis, better known to some as ping-pong, to your desktop. 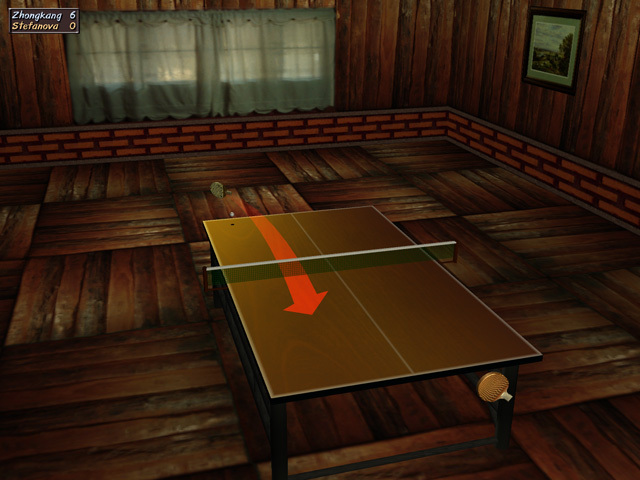 Using a unique artificial intelligence engine, Table Tennis Pro pits you against several opponents with different styles, strengths, and weaknesses, all in a nicely rendered 3D environment. Lob or slam, spin or spike, and become a master of the table in this competitive and addictive game.
. 31 Intelligent Computer Players : Each with different serving, playing styles and difficulty levels.
. Strategic Game Play : The unique control system combined with intelligent opponents allows for all table tennis situations to present themselves - shot drop shots over the net, floating back spin long shots - curling side spins - the choices are unlimited making the gameplay fantastic - all you'll need to do is practice.
. Multiplayer : The high skill factor involved in the game makes this an awesome game to play against a fellow human - nearly as good as the real thing !
. True 3D Environment : Includes 12 different playing rooms, multiple table surfaces, nets, stands and balls.
. Two-Player Games : Single- or split-screen modes for playing another person on one machine.
. League and Tournament Competitions : Get involved in a long term competition to see where you stand. Table Tennis free sports game is something for real table tennis lovers. Freeware to help clubs and referees to manage a Tennis tournament. Qweas is providing links to Table Tennis Pro 2.32 as a courtesy, and makes no representations regarding Table Tennis Pro or any other applications or any information related thereto. Any questions, complaints or claims regarding this application Table Tennis Pro 2.32 must be directed to the appropriate software vendor. You may click the publisher link of Table Tennis Pro on the top of this page to get more details about the vendor.